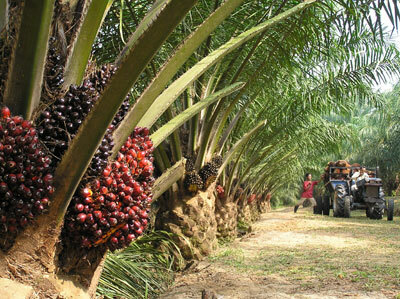 Palm oil comes from the fruit of oil palm trees (Elaeis guineensis) which grow in many of places including Borneo. The palm oil trees are grown on plantations. To make room for the plantations, miles of rainforest are burned leaving many animals without homes and emitting greenhouse gasses into the atmosphere. 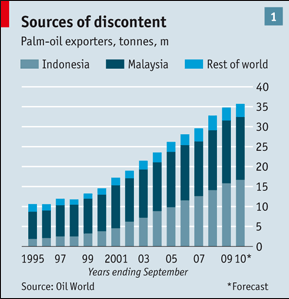 In Sumatra and Borneo, palm-oil expansion threatens elephants, tigers and rhinos, as well as orang-utans. Enormous amounts of carbon dioxide are released as forests and peatlands are destroyed. 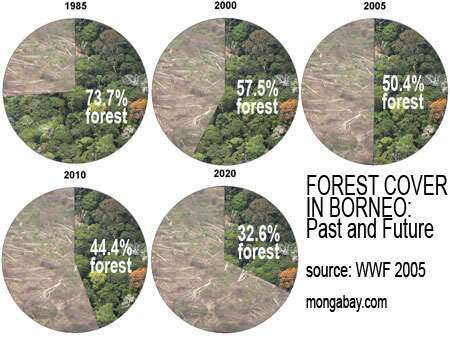 Deforestation makes Indonesia one of the world’s largest carbon-dioxide emitters. More and more rainforest is being destroyed and soon there will be none left. The rate of deforestation is terrible. One of the ways we can help the rainforest and give hope to the orangutans to reduce our demand for palm oil. Look on product labels to check for palm oil before you buy it. Many things contain palm oil that you wouldn’t expect. It is even used in some soaps! WWF, an environmental group, says it is used in 50% of all packaged supermarket products. Many of my favorite snacks and chocolates contain palm oil so I find other snack alternatives to reduce the demand for palm oil.